Yes, MOM's Organic Market is about to turn 25! The Washington region organic grocery story is an area icon for it's forward-thinking in bringing organic food to the nation's capital. 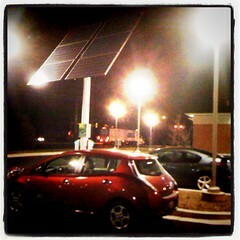 But MOM's is more about organic nutrition; MOM's is also a great area advocate of Electric Cars. After all, MOM's of College Park and of Herndon were some of the first places J1772 EVSEs started showing up in this area. And the newly-reopened Rockville store, the one where it all began, is also sporting it's own EVSE. Last Friday, a woman calling herself Amanda on the MyNissanLEAF forum posted an urgent request for help in organizing the distribution of one hundred Level 3 Charging Stations. Needless to say, this caused quite a local buzz as these would be the first L3 Chargers South of the Mason-Dixon Line East of the Mississippi, outside of Tennessee and certainly the first in the Mid-Atlantic region. Between that and my copy of the Diablo III Collector's Edition arriving it has been one incredible weekend for this EV Reporter! Amanda reported that the stations in question will be the ChargePoint Level 3, CHAdeMO / SAE J1772-DC dual-gang equipment as pictured. While the QuickCharge Wars rage between TEPCO's CHAdeMO and the SAE's J1772-DC extension heat up, this unit hedges its bets by supporting both, making everyone happy. Great choice! After a bit of digging I found more information about the company Amanda represents. Thier full name is actually EV Green Stream and they're a Baltimore-based company. I spoke with Zack at EV Green Stream and he confirms they're looking for homes for about 30 or so units, but nothing is concrete until contracts are signed. However, some urgency must be added because they need to have signed documents by 1 June so it behoves us all to help out and make sure those wonderful L3 stations find homes that our Nissan LEAFs and Mitsubishi iMiEVs would like to visit! But wait, the title says Level 2, not Level 3!? You are very astute or just read the comments and realized that we were in fact being taken for a ride. You see, on Monday, after I'd posted this, Amanda amended her request to say that in fact it was one hundred Level 2 stations being installed, not Level 3. Yes, she confirmed Level 3 on Friday even after someone posted a link to the unit pictured above, but what's done is done, and now we know the truth. Level 2, though great, is pretty common in Maryland and to a lesser extend in Virginia—less so in Washington D.C. since most of the units there are in garages that aren't even opened on weekends. None the less, we should all help to give these Level 2 stations homes even if they're not quick charging. They have to be installed in the State of Maryland somewhere. It cannot be in an automotive dealership. It has to be a commercial business. We will charge for the installation but the charger is free. We have to have a signed contract on installation by June 1st. So, no locations in Virginia, Deleware, West Virginia or Pennsylvania! Also, note that Amanda estimates the cost of installation to be about $3,000. As for the electricity cost, we know the LEAF for instance takes about 20kWh to go from 0% to 80% on a quick charge (more like 16kWh according to some posts in the MyNissanLEAF forum) and at 13¢⁄kWh that's only $2.60 at Level 2, the Nissan LEAF draws about 3.8kW of electricity so in one hour that represents about 49.8¢ based on 13¢⁄kWh, the regional average rate. For the Ford Focus Electric with its 6.6kW charger, it comes to about 85.8¢ but most EVSEs can't put out more energy than that so at $1.00 per hour, you won't be making the LEAF and Volt (3.3kW) drivers happy but at least the Focus Electric folks are getting their money's worth. Overall not a huge loss for the free advertising you get on sites like PlugShare. Now, for me, my main goal would be to see them put in at the National Harbor, where they held the first Nissan LEAF event in the area and as the perfect first rest stop on the I95 corridor in Maryland going North. I've also suggested Maryland House and Chesapeake House—need to contact HMS Host about that— but they don't really make sense for Level 2, only Level 3 as people don't stay there for hours. Others on the MyNissanLEAF forum have suggested the US Route 50 corridor and I would add the I270 / I70 corridor and a site around Bethesda. Finally, I'd suggest one in Silver Spring where we hold the EVA/DC meetings, though alas not the Library as the Library isn't a commercial business—and hopefully not The Blairs if they're gonna have the same connectivity problems the current EVSEs there do. What would you suggest? Labels: CHAdeMO, Chevy Volt, EVA/DC, EVSE, Ford Focus EV, iMiEV, Maryland, MyNissanLEAF, National Harbor, Nissan Leaf, PlugShare, SAE, Virginia, Washington D.C.
My friend and fellow Nissan LEAF enthusiast Kayne Karnbach maintains a wonderful blog about electric vehicle. In his latest entry, he investigates the charging infrastructure in Prince William County and Manassas city. I believe Kayne is right about location but would add that movie houses and all those strip malls on VA 234 Business would also make great locations. The sad thing about the railway station parking is most people will be leaving their cars there for 8–10 hour stretched which would fill even a LEAF from empty. Seems to me the perfect situation where valet parking would be an advantage, where a Volt could get the first 4-hour shift, and a LEAF the second 6-hour shift on the same outlet, with the Volt coming from thirty to forty miles away and the LEAF from seventy to ninety. And is the usual case will be much less, the time at the outlet could be even more greatly reduced with the valet managing how long to charge each one to a minimum of need. Last week I took the opportunity to address the Manassas City Utility Commission regarding their public charging stations. Manassas has recently debuted public charging stations for EVs and PHEVs. Here’s the gist of my address. Don’t trust that data! Two years from now, the city of Manassas will review usage data on each charger. The conclusion that data will lead decision makers to is probably one of little or no benefit to having public charging available. If reached, that conclusion will be wrong, and here’s why. Public chargers are being installed with little thought on where and why to install them in the first place. Because of this, EV owners will neglect to use the stations, since they don’t fit their charging needs. Why don’t they meet EV owners’ needs? EV owners are looking for places to charge that allow them to be plugged in for at least two hours, providing the kind of charge that will allow for at least 30 miles of range. Plugging into a charger for anything less will result in 15 – 20 miles of range, hardly a reason to make a special trip to Manassas. The only viable placement of public charging in Manassas at the moment is in the parking garage at the Virginia Railway station. It is conceivable that someone could plug in while parked in the garage, presumably during work. While this does make sense, it assumes EV owners are driving to Manassas from a distance of + 45 miles, since anything less wouldn’t necessitate a charge to make it home. That would be the equivalent of someone driving from Front Royal to Manassas. Not likely. Coming back from the EVA/DC meeting yesterday I almost achieve what I thought impossible: entry into the elusive 100 mi club. Normally when I attend the EVA/DC in CO2 Fre Nissan LEAF I need to top off but thanks to my LogCARWINGS.py script I was able to verify after a half-hour of battery leveling my LEAF settle on 70.091 mi (112.800 km) range under normal drive (though I drive ECO) or 58.876 mi (94.752 km) with climate control. In the spring I generally don't use climate control and a quick check on Google showed that the trip home with the stop off in Silver Spring would only be about 54.1 mi (87.1 km) so I should be able to make it. 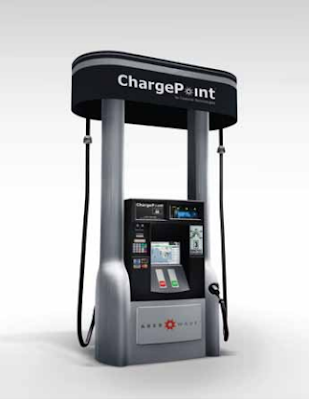 This, after all, is the ideal option because when I charge at Silver Spring, I have to use the Sema Connect stations at the Blairs and pay $3.00 for three hours of charging when I only need about one. Of course, that assumes they're actually able to communicate with the network that night, otherwise I don't get to go home! And yes, that had happened but my friends at the EVA/DC had helped me out so of course I had arrived home and am able to tell you about it. Thanks to Bryan and Rob (that's Bryan's Volt in the picture to the left), we had been able to get CO2 Fre the necessary electricity even though the sun had long since set at the solar EVSE at Suntrust in Bethesda. Needless to say I don't like those EVSEs at the Blairs. Yesterday I got home with 9 miles (14 km) left in ECO mode and one bar remaining. I didn't even get to the first low battery warning. But the car did report 6:30 of Level 2 Charging (18 hours of Level 1, 19 after the battery leveling 40 minutes later). Since I try to keep my charge window at 01:00–06:00 to avoid higher electricity rates, my car finished charging with 30 minutes of Level 2 (50 minutes of Level 1) remaining and eleven of twelve bars. Knowing that I could probably manage a normal commute with ninety percent battery charge I decided to risk leaving without topping off. I'm guessing I should have no problem getting home as my car now reads seven out of twelve bars and 3:00 hours of Level 2 charging (8:30 of Level 1), more than half a pack. The official registrar of the 100 mi / 161 km club is the MyNissanLEAF community which works on the honor system. As I can't say what I started with nor remember exactly what I ended with even if I had driven 100 mi I wouldn't post it unless I could be sure. But it's nice to know even with my mostly highway driving that goal is possible. Who knows, maybe someday. Dear Electric Vehicle (EV) fans and members, Please join our rowdy crew on Wed, May 16 from 7–9 PM and stay for networking afterwards as long as you like. Please forward this message to others you think might be interested. Unfortunately, I have a business trip out of town that I could not avoid, so I will not be in attendance, nor will our VP Eric Cardwell, so our President Emeritus and Program Director, Dave Goldstein, will be leading the discussion, with your help. Jean Gough from 350Green will discuss their plans for chargers. Chip Gribben and updates on the 200 mile per hour motorcycle in the &fra14; mile drag race. Finished in under 7 seconds. Gobs of postings on this. Chip will fill us in. Bryan Murtha has updates on our EVADC license plates for MD. Bring your checkbook. Lanny Hartman will tell us about the Maplelawn meet up of EV owners/leasors. George Lopez, Doron Shalvi, Dave Goldstein and others who brought EVs to the Solar and Wind Expo in Timonium MD this last weekend will tell us about how it went. John Alder and Lanny have purchased Th!ink all electric cars for the LOW LOW price of $15,000 after the federal tax credit. Wow. As seen at the Solar and Wind Expo. I drove it. Feels good. 2 seater. I'm sure I forgot some important items, but you all can work it out. See you next time. Velcro is a rip off! I'm reading a book about anti-gravity. Its impossible to put down. Also of note I'll be bringing my newest, oldest charger to show off my NEMA flexibility! 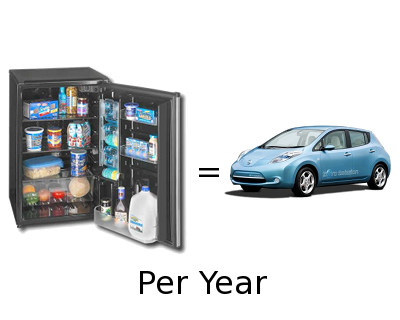 Changes for a Better EV Life: Charging at work costs less than a Mini Fridge! During business hours a typical mini fridge is drawing about 320 Watts (W) of electrical power. A car plugged in to trickle charge on the other hand is using about 120 Volts of Alternating Current (VAC) × 12 Amperes (A), and thus an average of 1,440 W peak. Note, since A/C is a sine wave, the maximum power used at the peak ends of each cycle is 2,036 W (The maximum for a sine wave with a given Root Mean Square — multiply by √2) but 0 W is used at the middle of the cycle so overall the 120 VAC average is produced. This is therefore about the equivalent of the power used by just 4 typical mini fridges. The mini fridge runs 24 hours a day, continuously, and thus uses about 7.68 Kilowatt⋅Hours (kWh). The EV on the other hand is only drawing power for 8 hours a day and thus uses about 11.52 kWh, and thus is about equivalent to that of the 1½ mini fridge. In a typical year, running 365.2425 days that same mini fridge is using 2,805 kWh of electricity. But the employee who works 40 hours a week, 46 weeks a year (including 2 weeks fixed vacation and 4 weeks flexible vacation) uses only 2,764 kWh of electricity, and that's less than what a single mini fridge uses! So, wouldn't it be cheaper to ban mini fridges and allow electric vehicle charging at work? Please share this invitation with your friends/listservs. Our January meeting will be on Wed Jan 18 from 7 - 9 PM at the Silver Spring, MD public library on Colesville Road, just inside the Beltway and only 4 blocks north of the Silver Spring METRO. We will endeavor to start and finish on time, but there will be plenty of time for the best part of the meeting, BS-ing, before and after the planned agenda. The DC Auto Show is in late January at the Convention Center and we want to be there. Eric Cardwell, ace VP of our club, is heading up this operation. Lots of good ideas are percolating already. EV license plates and membership categories. Bryan Murtha will update us. Who bought/leased a new EV? Any issues? Charging stations: New ones, Where, Issues? Reveng of the Electric Car. Movie premier in Baltimore. How did it go? Charging at work with 110 volt outlets. Cheap. Bob Bruninga update. California ZEV and Federal MPG standards. How does this affect EVs? Other agenda items you want to discuss? Charlie Garlow, your Prez and a host of fantastic volunteers. How about the property tax rate in Fairfax, Virginia? Just a reminder about tomorrow (Wednesday's) EVADC Meeting. And to say that we got some feedback on topics, including questions about the Chevy Volt and any difficulties, including the fire controversy [overblown, in my opinion]. Here is the previous message. Please forward to others. Bring a friend.